A couple summers ago I took a trip back to the mother land (my native Poland) with my mama. It had been sixteen years since I'd been back on that soil and I was completely in awe. I saw it with new (grown up) eyes and was really able to appreciate where I come from. We visited the house where we lived with my beloved grandmother until I turned four, before my mom and I moved to the states. My heart welled up with memories of my past and understanding of my heritage. My personal history, that is beginning to work its way into my art, came to life for me. I was so overcome with this reunion with my roots that I did my best to pick up little pieces of Poland along the way: dozens of photographs of the landscapes and relics of old, and wild flowers to press between the pages of my journal, which was filled with my impressions of all I took in. I even brought home a handful of earth. That little bag of my home land has been sitting unopened with the other mementos, until today. After making plans to see an old Polish friend who has never set foot on the land, I decided to share my wealth of, well, dirt. Tonight, with the patient guidance of my dear friend, Erin, these little beaded memory capsules were born. 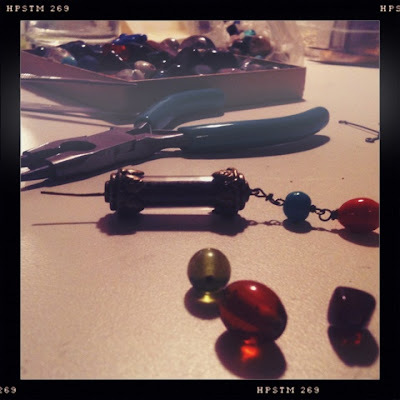 The master and the apprentice- my first official lesson in beading and jewelry design. I love them! They hold some of the earth I used to make mud pies out of as a child. Now we can both carry a piece of Poland with us. I absolutely love the necklace. Every time I look at it I smile and think of my dear friend. Not sure how I feel about being refered to as your "old" Polish friend. I love that I was in your thoughts in the midst of all that was in your head and heart at the time. I love you. Buzi.